Right now bears seem to be trying to get my attention for a variety of reasons. 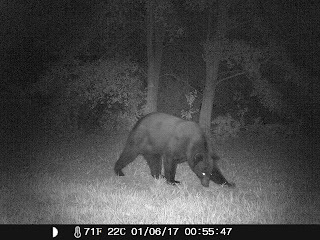 They seem to be in the news, my Inbox, and even visiting the backyard at night of a friend living in a planned Florida community. 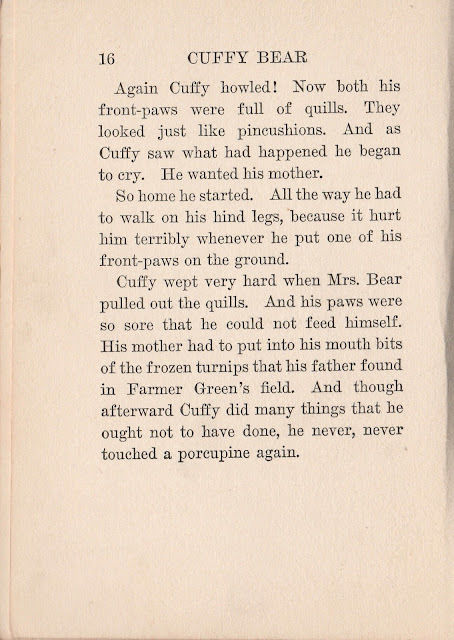 I've given stories before by Thornton W. Burgess and mentioned years ago having an elderly lady tell me everything she knew about animals came from his books. It would have been easy to discount the books as old-fashioned tales of animals acting like people. The more I looked, however, the more I saw their value. At the same time as Burgess wrote, Arthur Scott Bailey was doing roughly the same thing, but is less well known. One thing I miss about not working in one location these days is I don't get to try out material with a special group. More importantly, I don't get to develop continuing stories that might become a program just about that character or topic. 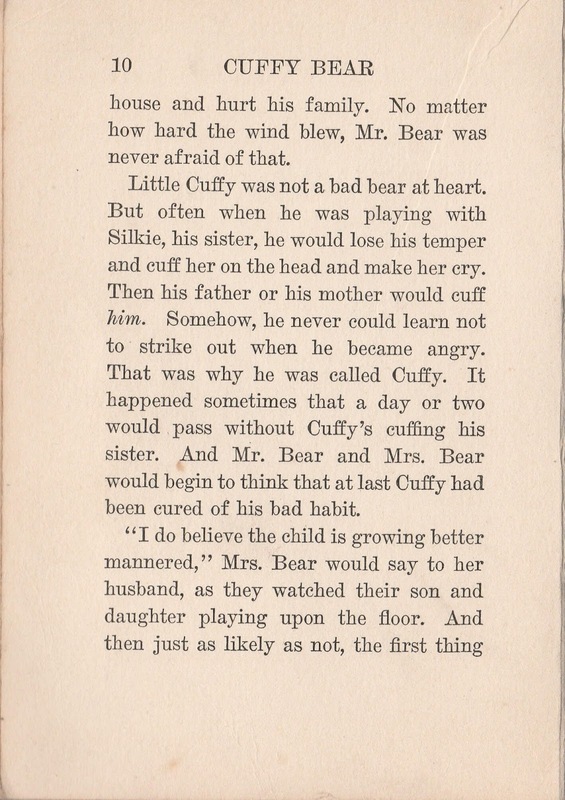 Bailey's mischievous young bear, Cuffy, is a perfect example. 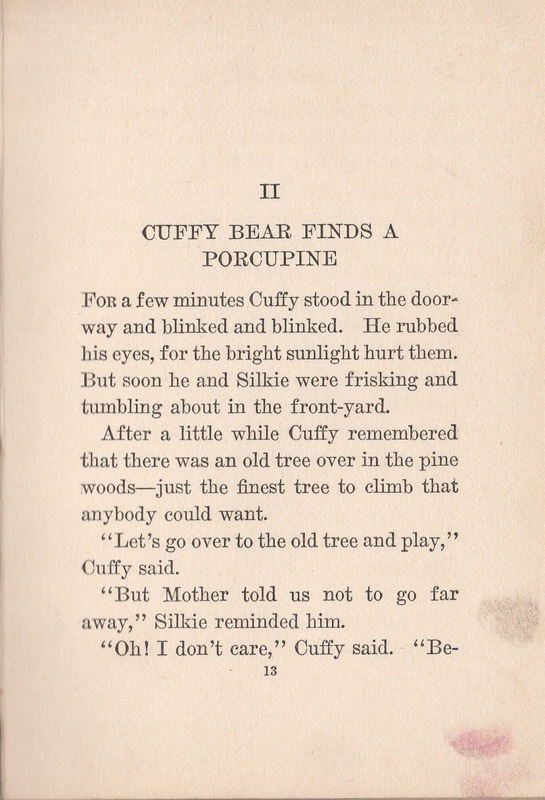 He was the first of many of Bailey's characters starting in 1915 with The Tale of Cuffy Bear. Bailey wrote over 40 books through the 1920s, including four more about this mischievous, always inquisitive little bear who manages to be true to both bear behavior (ignore placing him in clothing a la Beatrix Potter) and that of his young audience. In 1929 he brought Cuffy back in Cuffy and the Circus; Cuffy and the Scarecrow; Cuffy Bear's Holidays; and Cuffy Bear and the Snowman. 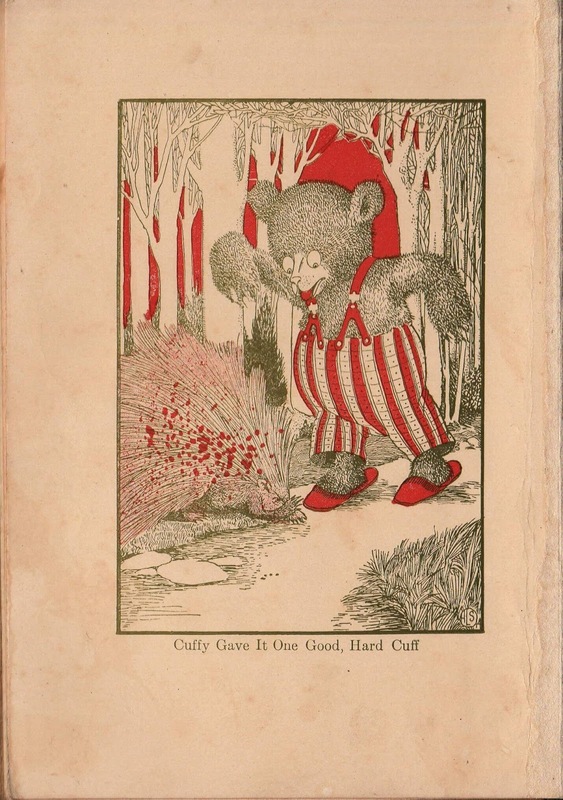 I've no idea if those follow-up adventures stay true to both ursine and childlike character. Since I anticipate no opportunity to do programs with his many adventures, I've ignored copies of Bailey's books often in antique stores. They remind me of The Velveteen Rabbit as they generally bear the scars of being well-loved, i.e. clearly read, by children, . For the coming month and a bit more, I'm going to be very busy. Bailey's The Tale of Cuffy Bear seems well suited to appearing here. The stories are short and described by C.D. Merriman for Jalic Inc. on Online-Literature.com,also known as The Literature Network, as being "charming whimsical tales. Rich in adventure and lessons in responsibility and growing up, they also teach easily understandable information about the animal world. Bailey weaves tales that are enchanting and educational, with references to nursery rhymes and folklore, lushly illustrated by Harry L. Smith.". Wikipedia quotes this review from the Newark Evening News: Mr. Bailey centered all his plots in the animal, bird and insect worlds, weaving natural history into the stories in a way that won educator's approval without arousing the suspicions of his young readers. He made it a habit to never 'write down' to children and frequently used words beyond the average juvenile vocabulary, believing that youngsters respond to the stimulus of the unfamiliar. 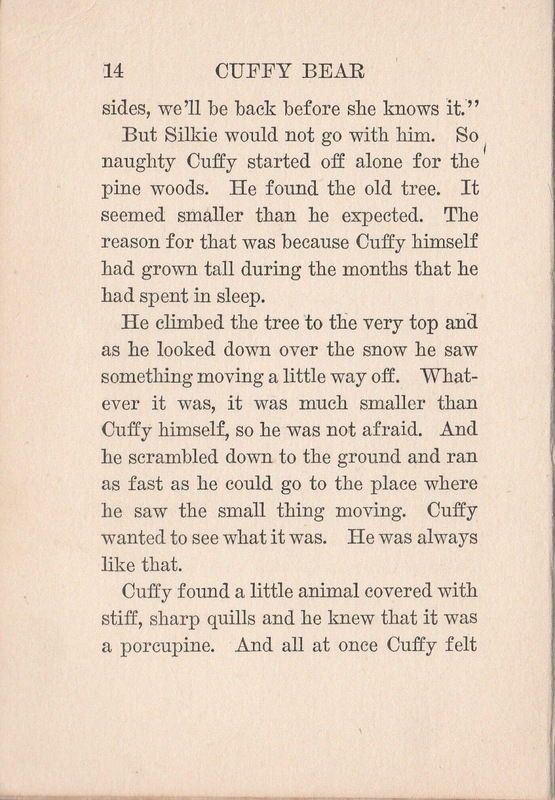 With those evaluations to validate its appeal let's introduce Cuffy. I'll add a bit more background and look ahead later. 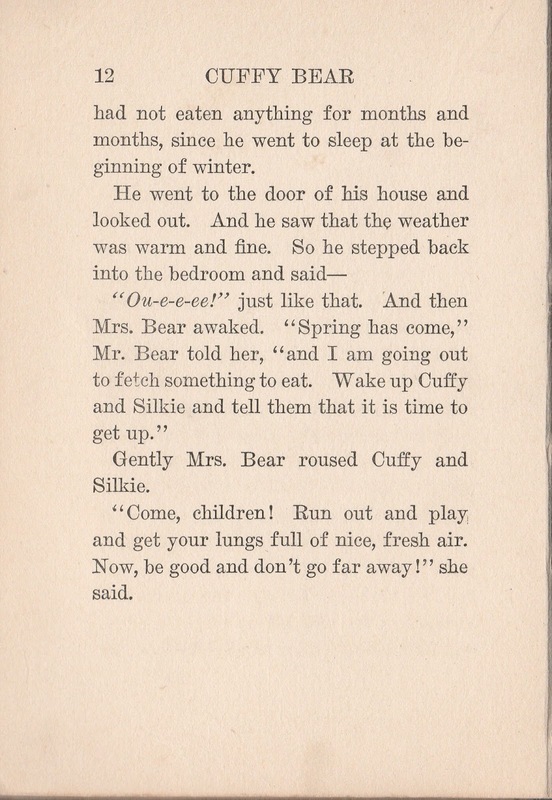 Lois here with a brief interruption: If you go to The truth about bears and hibernation you will discover bears hibernating during the winter is a common misconception. O.k. if you can get past that bit of information you'll discover they do something fairly close to it called "torpor." 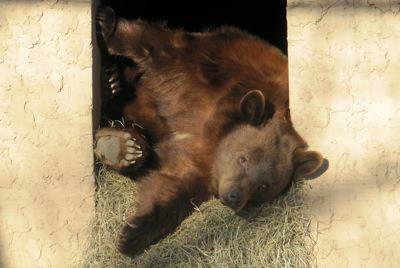 The difference is their body temperature, unlike true hibernators, doesn't drop to match the outside temperature. However their heart rate is extremely low, they don't eat (well, some may snack a bit! so leave them alone -- some even briefly come out of their dens for a short, slow check on warmer days), nor do they release bodily waste, and they live off extra body fat stored right before winter. As a result they come out leaner, but without losing muscle. 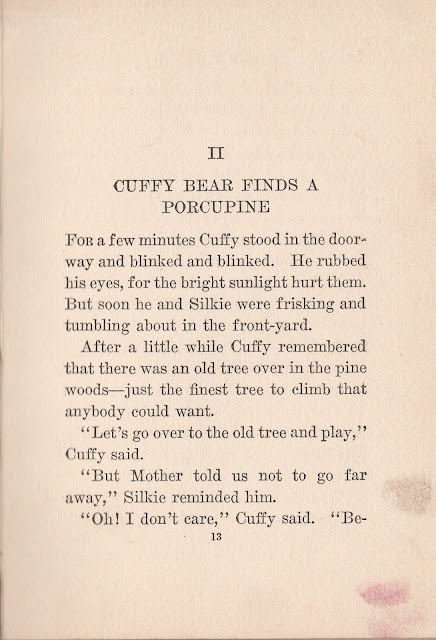 But Cuffy is now awake and ready to get into trouble beyond cuffing his sister. I didn't want to give that picture by Harry L. Smith and show what was going to happen, but grown-ups saw it coming I'm sure. I once had a "rescue" malamute whose history said she had tangled with a porcupine and had to have the quills removed. She never did trust veterinarians after that, so it was good to know why. Of course, just as Br'er Rabbit makes a similar mistake with the Tar Baby, it's not unusual for somebody who is angry, or as Bailey put it, "loses his temper", to make the mistake of striking again. 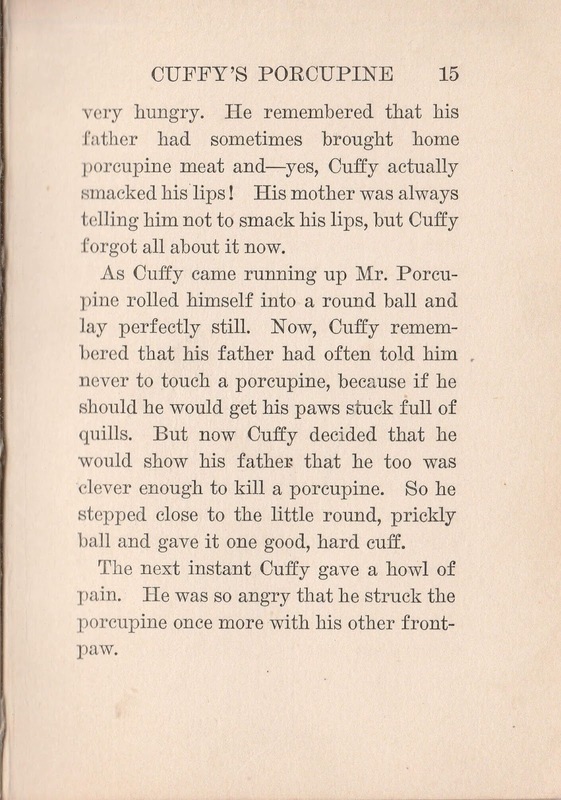 Cuffy's paws definitely taught him to leave porcupines alone. Now if I could just teach a dog to leave alone any black kitty with a white stripe who has a strong smell. 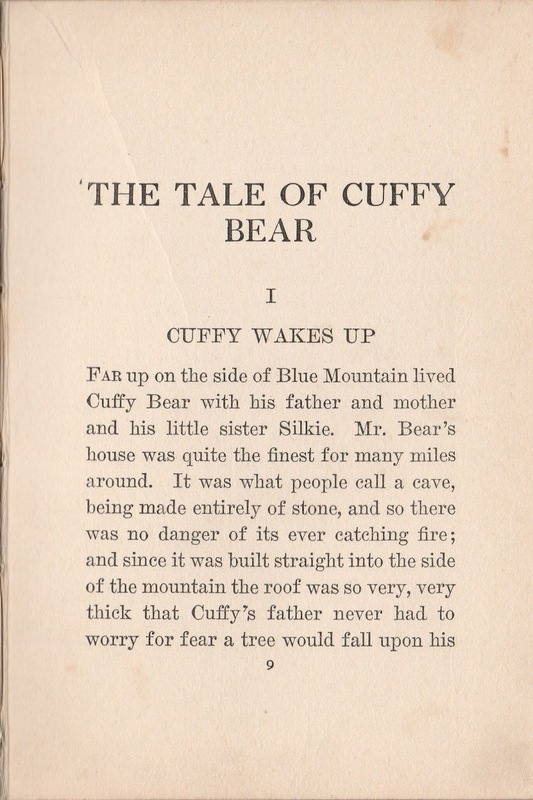 My own battered copy of The Tale of Cuffy Bear doesn't include this initial comment from a similar series of Bailey's books. To you;--parents, guardians, teachers and all others upon whom devolves the supremely important responsibility of directing the early years of development of childhood, this series of Tuck Me In Tales which sketch such vivid and delightful scenes of the vibrant life of meadow and woodland should have tremendous appeal. In this collection of stories you will find precisely the sort of healthy, imaginative entertainment that is an essential in stimulating thought-germs in the child mind. 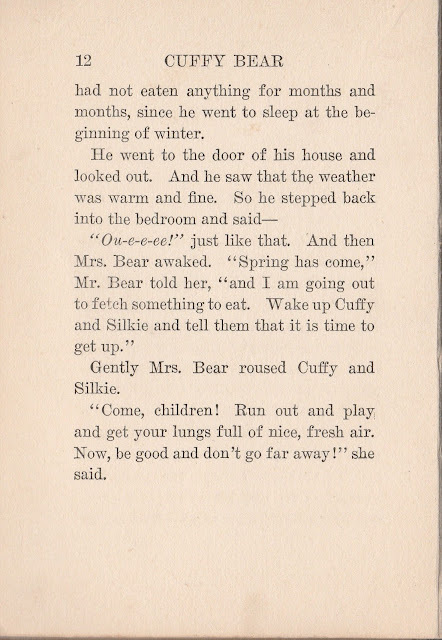 Bailey's books were in several series, that introduction came from the Tuck Me In Tales. 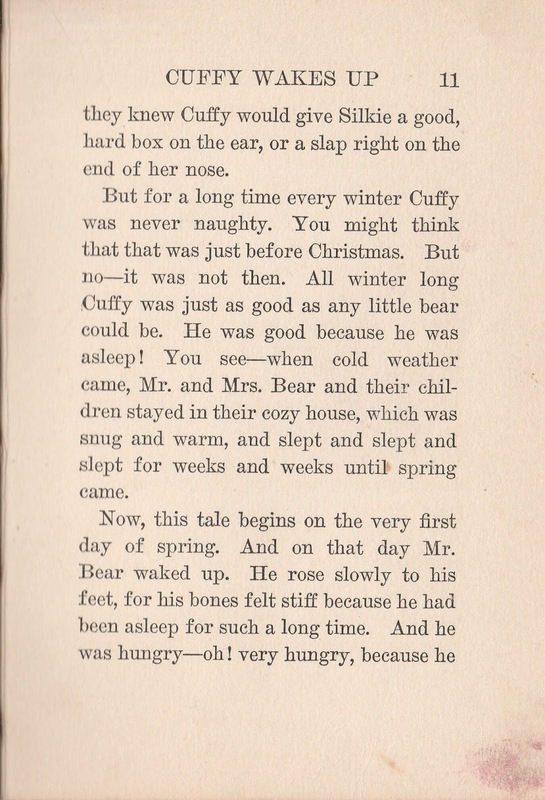 The Tale of Cuffy Bear was part of the Sleepy-Time Tales series. There was also a series called Slumber-Town Tales. Those series titles seem to give a good indication of how Bailey began writing. 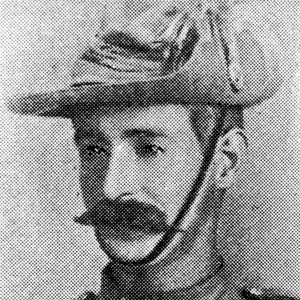 The Wikipedia article mentions various personal facts about Bailey's life, including speculating he probably began writing for the young children, Allen and Estella. He raised them as his own although they were from his wife's previous marriage. Since he is not known for writing before his marriage, that seems a fair assumption. Wikipedia concludes with one other interesting side note. His stepson, Allen, grew up to become the Professor Emeritus of Forest Management at West Virginia University, and even has a scholarship named in his honor. Bailey's training? 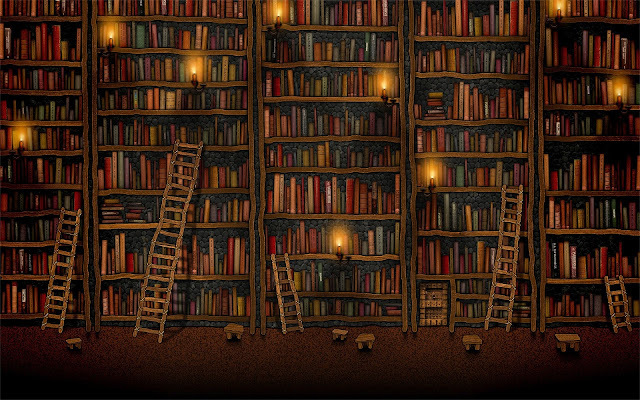 Thirty-nine of Bailey's books can be found on The Literature Network, which offers a large searchable supply of online literature (3500 full books, over 4400 short stories and poems by over 260 authors, plus a quotations database of over 8500 quotes, and over 340 quizzes). As if that's not enough, they also have additional Forum discussions. You just may want to explore the site. They post that USA Today listed it one year in its annual article, "Hot Sites." Looking ahead, as I said, the next several weeks will be busy. 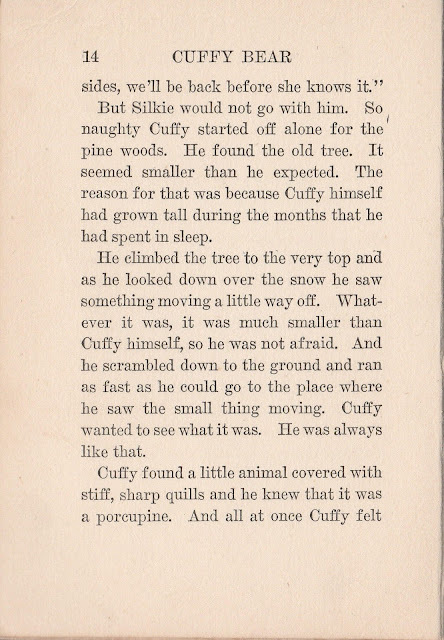 As a result I'm planning more of Cuffy's adventures from the original book about him. 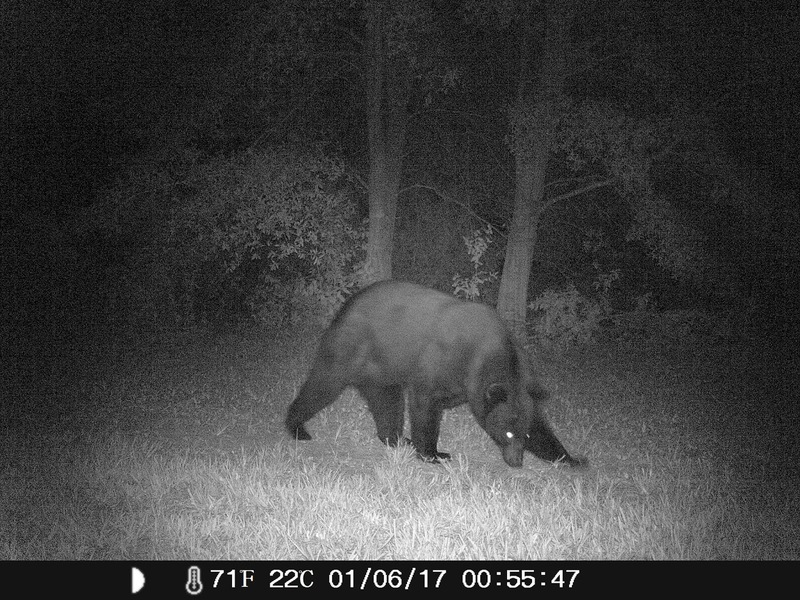 I am thinking about these topics: animals swimming without instruction; eagles; bees (definitely not the same as in Winnie the Pooh); forest fires; and possibly a second look at hibernation.